As with all digital systems, a successful application of CAN-MD® relies upon properly engineered software. Therefore, close collaboration is needed between software developers and machinery diagnosis practitioners to arrive at the optimal solutions for integration. The process of integrating CAN-MD® into existing CAN bus systems can be performed by machinery diagnostics and software experts already on staff by the end user with use of the detailed CAN-MD® Interface Control Document (ICD), by an authorized independent CAN-MD® solutions providers, or directly by Dytran/SAGE. CAN-MD® developer kits are available with a variety of hardware configurations to aid in the integration process. Along with preconfigured hardware, developer kit users can receive a copy of the ICD, a detailed description of how the sensor communicates with the bus. The ICD enables full integration into existing CAN data recorders and machine control units. Dytran/Sage has successfully conducted CAN-MD® system integration with a variety of industry available hardware. Below are examples of such CAN-MD® integrations conducted at Dytran to provide users with examples of how to utilize CAN-MD® with a variety of CAN devices. We would be glad to discuss your individual applications and integration needs. We stand by to support your digital monitoring transformation. 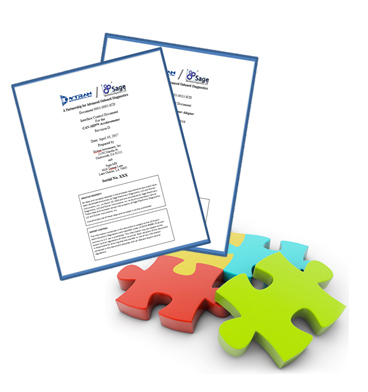 Dewesoft is a manufacture of versatile and robust data acquisitions systems. Their systems are deployed in a variety of applications from vehicle testing to structural dynamics. 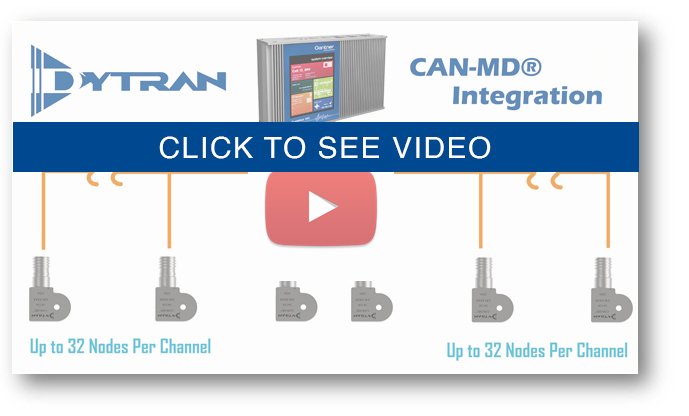 Dewesoft hardware can support a variety of data inputs including CAN bus which is present on many of their systems, allowing the connection of up to 32 nodes of CAN-MD® sensors per CAN channel. The Dewesoft X3 software package provides powerful data analysis and presentation tools within a user friendly ecosystem. With a few simple steps our engineers were able to utilize the Dewesoft hardware and software to make meaningful measurements with CAN-MD®. For this integration a Dewesoft DC CAN2 module was deployed with two CAN-MD® accelerometers. 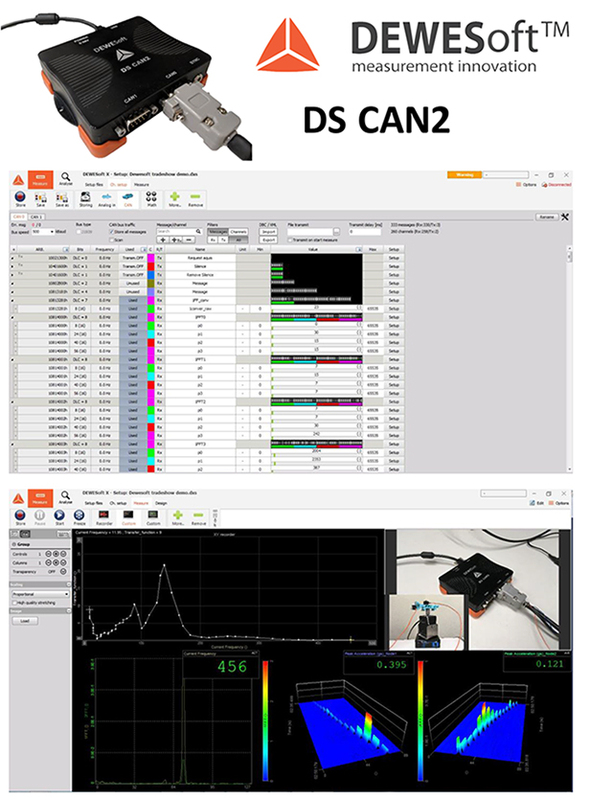 The DS CAN2 has two CAN channels supporting up to 62 nodes of CAN-MD® sensors. The Dewesoft X software package provides the user with the ability to create scripts easily with their configuration screens. In the case of this integration, the system was configured to receive the data points of an FFT calculated on the CAN-MD® sensor. Once the Dewesoft X software was configured to accept the FFT data from the CAN-MD® sensor the data could easily be displayed with the excellent selection of plotting tools provided by Dewesoft. The data can also be used for further analysis. In this case a FRF was calculated in the software from the FFT data calculated on the sensors. Dytran has conducted an example CAN-MD® integration utilizing the Gantner Q.station101-DT unit. The Gantner Q.station is typically found in test cells, production lines, and a variety of industrial automated environment. The architecture of the Gantner Q.series requires a Q.station controlling and additional modules for data acquisition, digital inputs/outputs, and additional communications. However, like many other industrial process control devices, Q.station has two independent CAN modules. This makes it possible to switch the measurement chain architecture to utilize CAN-MD® technology. The below Integration video discusses how a typical Gantner user can integrate CAN-MD® into their monitoring application. The number of possible CAN devices that can be integrated with CAN-MD® are countless. The above examples are just a brief preview of what is possible with CAN-MD®. If you are a manufacture or user of data acquisition systems with CAN, CAN loggers, CAN gateways or other connected devices we look forward to working with you to bring CAN-MD® to your platform as well. Please contact our team at canmd@dytran.com for more information on integration.